Research projects conducted in my lab are focused on the development of learning and cognitive processes during the infancy and early childhood years. In general, we are interested in the development and relationship between two types of learning in young children: Supervised, hypothesis-testing learning and nonsupervised, implicit learning. (4)determining whether individual differences in implicit learning processes offer unique contributions to educational achievement. Coldren, J. T (2013). Implicit learning in kindergarten children. Poster presented at SRCD - Seattle, WA. Coldren, J. T (2012). Dimensional learning in kindergarten children in the absence of hypothesis-testing. 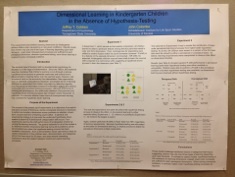 Poster presented at the Association for Psychological Science Conference, Chicago, Ill.
Coldren, J. T. (2012). 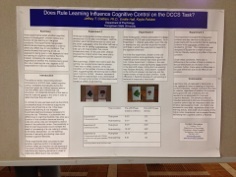 Does rule learning influence cognitive control on the DCCS task? Poster presented at the Association for Psychological Science Conference, Chicago, Ill.